It is never too late to change your life. At Planetary Health International we offer a world unique holistic and comprehensive life transformation program which addresses relationship distress & conflict, illness such as cancer, diabetes, heart complaints, IBS & other gastrointestinal disorders of brain/gut axis, anxiety, depression and other life challenges, in our opinion many of which are rooted in an early life traumatic event or events. Our world unique comprehensive holistic health program uses lifestyle medicine model and functional health which incorporates a gut repair program, psychotherapy, embodied tantra, conscious parenting/relating and plant based nutrition which bring about feelings of integration, optimum health, vitality, longevity and well being. This program will assist you in thriving rather than just surviving and help you to live life at a much higher level. Anything you desire in life, you need energy to obtain and achieve, the kind of energy that only comes from optimum health and passionate relationships. Book in now for a comprehensive consultation to find out more about this world unique life change transformation program and get to the root of your life challenges so you can live a life of health and vitality. With our expert guidance you will learn to self regulate, heal your gut dysbiosis and reset your gut for health, activate parasympathetic nervous system for sustained relaxation, seek corrective emotional experiences through healthy and passionate relationships, invoke and strengthen healthy immunity with a healthy diet that does not feel like a diet,resolve emotional distress and dissociated painful experiences of the past and awaken a power inside you to take your health into your own hands. Lifestyle medicine is a branch of evidence-based medicine in which comprehensive lifestyle changes (including nutrition, physical activity, stress management, social support and environmental exposures) are used to prevent, treat and reverse the progression of chronic diseases by addressing their underlying causes. Lifestyle medicine is often prescribed in conjunction with our trauma recovery programs. Life Change Health Institute provides leadership in research, prevention and treatment of lifestyle-related diseases through lifestyle medicine. Lifestyle medicine includes functional health, plant based nutrition and complex trauma recovery. Functional Health addresses the underlying causes of illness & disease, using a systems-oriented approach and engaging both client and Plantrician in a therapeutic partnership exploring diet, lifestyle, trauma history, relationships, body and stress. This is an incredibly effective holistic approach to recovery, incoporating the very latest in gut research and psychobiotics, Dynamic Psychosocialsomatic Psychotherapy, conscious relational sexuality via Embodied Tantra and Plant Based nutritional science. Functional Health is a healthy holistic journey out of anxiety, depression, eating disorders, diabetes, cancer, IBS and other gastrointestinal and autoimmune disorders. It is an evolution in the practice of medicine that better addresses the healthcare needs of the 21st century. By shifting the traditional disease-centered focus of medical practice to a more client-centered approach, Functional Health addresses the whole person, not just an isolated set of symptoms. Functional Health therapists spend time with their clients, listening to their histories and looking at the interactions among genetic, environmental, relational and lifestyle factors that can influence long-term health and complex, chronic disease, we also take a closer look at a clients relationship to food rather than just suggesting a diet, this is very effective for long term change, health and wellbeing. In this way, Functional Health supports the unique expression of health and vitality for each individual. 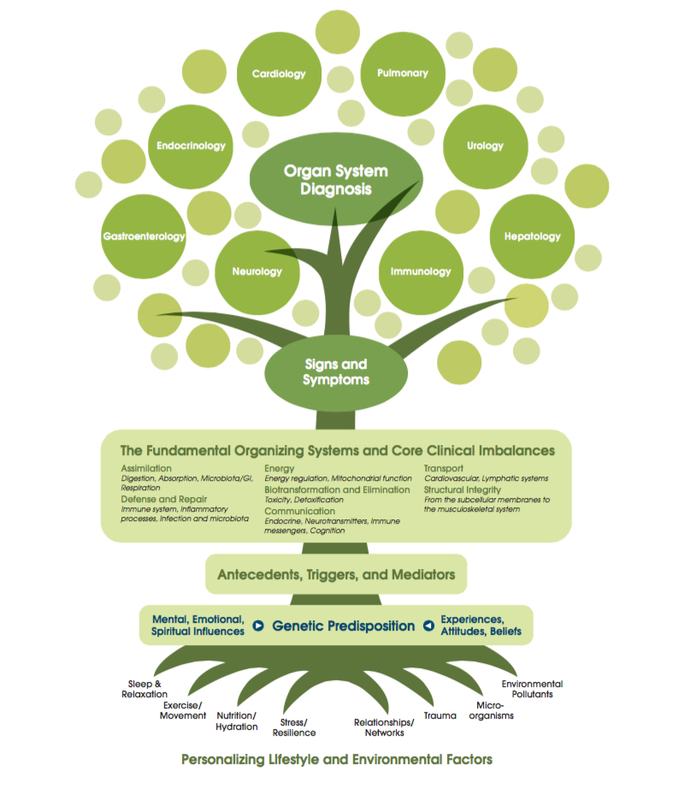 Functional Health offers a powerful new operating system and clinical model for assessment, treatment, and prevention of chronic disease to replace the outdated and ineffective acute-care models carried forward from the 20th century. Functional Health incorporates the latest in genetic science, systems biology, and understanding of how environmental and lifestyle factors influence the emergence and progression of disease. Functional Health enables health professionals to practice proactive, predictive, personalized health care and empowers clients to take an active role in their own health. In order to keep a tree healthy and allow it to flourish, you need to support the most basic and essential elements first; the foundation: the roots and soil. Similarly, if a tree is not healthy, the first place you should look for answers is those same foundational elements. In Functional Health, the same approach applies to clients. The most important factors, and the ones we examine first when gathering information about the client, are the foundational lifestyle factors; sleep, exercise, nutrition, stress levels, relationships, Microbiome and epigenetics. These are the roots and soil, which are in turn influenced by specific predisposing factors (antecedents), discrete events (triggers), and ongoing physiological processes (mediators), and may then result in fundamental imbalances at the trunk. These can eventually result in the signs and symptoms that are grouped into a diagnosable constellation that we call disease, represented by the branches and leaves.